At one time in your life it’s likely that you’ve had an injury, such as an ankle sprain or hamstring strain. It’s also likely that you applied ice to the damaged tissues, probably because your physician or physical therapist told you to do so. Was icing that sprained ankle a good idea? It depends. Limit edema formation via vasoconstriction, which reduces the metabolic and vasoactive agents that contribute to inflammation..
Reduce pain via decreased nerve conduction velocity. Facilitate muscle relaxation via decreased neural activity. Limit secondary hypoxic tissue injury via decreased metabolic and oxygen demand of living tissues. 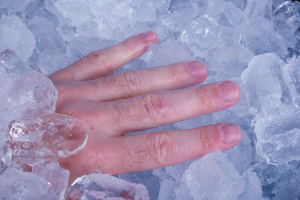 Applying ice to an injury will reduce inflammation. That sounds like a good thing, but it might not be. You see, inflammation is a natural part of the healing process. After an injury, the inflammation process kicks into gear and releases macrophages, which are a type of white blood cells that eat up cellular debris at the site of injury (macrophages literally means “big eaters”). When you ice a body part, vasoconstriction of the blood vessels decreases the amount of macrophages that can arrive at the scene of damage. The other benefit of macrophages comes from the release of insulin-like growth factor 1 (IGF-1) at the site of damage to promote tissue healing. Therefore, it appears that icing can slow the healing process, and that’s obviously something you don’t want. However, research demonstrates two possible benefits ice can provide after an injury. First, it reduces pain. That’s important because pain can change your brain for the worse – specifically, at the somatosensory cortex. Suffering through high levels of pain, when it’s not necessary, will increase the time it takes for you to clear it from your mind. Second, icing can promote muscle relaxation by decreasing neural activity to the cooled area. This can be beneficial when muscles are overridden with protective tension and filled with painful trigger points. However, this also means that icing can reduce your strength and power. So don’t ice your quads before a heavy set of squats. So back to that ankle sprain you iced after trying to impress the skaters at the park. If your goal of icing was to expedite healing, it probably wasn’t a good strategy. But if your goal was to reduce pain and promote tissue relaxation, well done! Once you feel numbness in the area, stop icing because the possible benefits it can provide are maxed out at that point. Furthermore, icing beyond the point of numbness increases the risk of tissue damage. This is one of the reasons why icing an area with impaired circulation or damaged nerves is a bad idea. Even though rest, ice, compression and elevation (RICE) has been viewed as the gold standard recovery protocol for decades, there’s always room for progress. Indeed, Gabe Mirkin MD, the sports medicine doctor that created the RICE acronym back in 1978, has distanced himself from it. Dr. Mirkin now recommends moving sooner rather than later (after it’s confirmed there are no broken bones), applying ice only to reduce pain within the first 6 hours after injury, and compression/elevation if there’s swelling. In summary, whether or not you ice after an injury depends on your goal. If you’re trying to reduce pain and calm trigger points, stick with it. But if it’s been more than 6 hours since your injury, keep in mind that icing will reduce inflammation to that area, which can slow recovery. Finally, this discussion about icing an injured body part shouldn’t be confused with cryotherapy in general. There’s some evidence that entering a cryogenic chamber for a few minutes, thus exposing the entire body to a frigid temperature, might promote recovery and potentially provide some health benefits. We’ll have to wait and see how that pans out. This entry was posted in Recovery by Dr. Chad Waterbury. Bookmark the permalink. This is very good info. I had heard for the last several years to ice for the first 24 hours and then switch to alternating ice and heat until the intense pain has begun to subside (usually 3 to 4 days). Are you suggesting to do nothing after the first 6 hours, or do you switch to another modality? CW: Thanks Steve. After pain is under control (i.e., tolerable) focus on compression and elevation if there’s swelling, and move the joint as much as possible, avoiding pain.